Deliver the honey to the Bear. 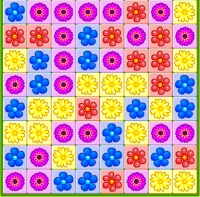 Click on a connected group of 3 or more flowers to remove the flowers just before the Bee. That will move the Bee forward to the next flower. Click to Play Bubble shooter for Free and Have Fun!